How heartening it has been over the past week and a half to see the phoenix-like return of my friend Lee Israel. She has soundly disproved F. Scott Fitzgerald’s tired axiom “There are no second acts in American lives.” By my count, we’re up to at least Lee’s fourth act. And who knows, she may have even written that axiom. Perhaps you’ve seen the New York Times’ profile of her or stellar book review, or various other media mentions. 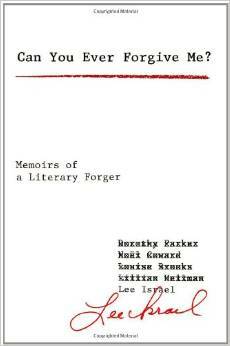 The book in question, Can You Ever Forgive Me?, chronicles Lee’s shady days as a literary forger. Act I was as a celebrity biographer. But I met her well after that, when she was hired as a copy editor at the publishing company where I’m employed. At least twice the age of most of the staff, and with a unique appearance and demeanor, Lee definitely stood out. It was clear from early on that Lee did not play well with others. (In one of our earliest encounters, she strongly scolded polite little me for making too much noise.) She repeatedly claimed that the work we were doing was below her. She had been a “star.” Sure, it could’ve come across as glory-days posturing. But when Act III rolled along, many realized that Lee had some legitimacy. For that was the heyday of the basic-cable biography shows. Lee showed up as a talking head on such programs as E!’s Mysteries and Scandals, providing background on her biography subjects Dorothy Kilgallen and Estee Lauder. I was proud of Lee. Heck, it was just cool to see someone I knew on TV. However, she had a mean streak. I remember how excited I was to show Lee that I’d finally gotten a long humor piece published in the Times. I pointed out to her that it only appeared in the New Jersey edition. “Still in the balcony seats, I see,” was her withering response. So that stung a little. And I was her friend. If you weren’t on her good side, watch out. She could be downright nasty. Doubly so if she’d had a double scotch with lunch. Or as lunch. Though she did spill the beans to a coworker or two, I knew nothing of her previous life of crime (Act II). When I eventually learned of her literary forgery, it didn’t surprise me. She had sent me many convincing emails in the voice of Koko the sign-language gorilla. All the while, it seemed like she might be crying wolf—or signing gorilla?—on a return to glory. The Kilgallen book had been once again optioned. Anne Heche was attached to the project. Showtime was interested. And yet… nothing ever came of it. Her tenure at my company came to an end (and it wasn’t pretty). We stayed in touch, emailing, and the occasional dinner with a stiff drink. I worried about her, as her finances were always shaky, and it’s obviously difficult to find work when you’re older. And all the more difficult when you’re difficult. And then one day, she told me her memoirs were to be published. By Simon-and-freaking-Schuster! Evidently the New Yorker had rejected the story as an essay, but an editor there was so impressed that he passed it along. So Act IV has finally arrived. I couldn’t have predicted the widespread attention the book has received, on both sides of the Atlantic. Certainly my workplace is abuzz, some happy, some shocked, some scandalized that a criminal was within their midst. Me, I was just giddy to receive a signed copy in the mail (though I doubted the Cabo San Lucas return address). And then really pleased that it was such a fun, funny read. So interesting to learn about (literal) chapters of a friend’s life that I knew so little about, and comforting to know her strong personality was fully in place long before I encountered it. I raise a glass to you, Lee. Yes, of course it’s single-malt Scotch.